What about an option for generating procedural moons on catalog planets and asteroid belts around dwarf planets (I was not referring to asteroid moons) because we don't want to write long scripts for hundreds and even thousands of asteroid as seen on procedural systems. you can use my asteroid generator if you like. http://fav.me/d8u0k9h good for making lots of asteroids in a belt. it might be hard to use at first, i am trying to make a better version right now. Can anyone point me to the problems in generating asteroid belts? I don't know anything about modding or editing files in SE, but if anyone can detail the process of creating asteroid belts i could make a simple web interface to create large number of random bodies inside given parameters. Currently this is not possible except do asteroids one or copy an existing system using already an asteroid belt (it can be faster but must rename all asteroids and their ParentBody). But you can create bodies one by one? Or you always have to copy? Renaming is easy if there is a pattern. As I said I don't know the first thing about any of this, but I think I can help if you are already doing it manually. But you can create bodies one by one? Or you always have to copy? Yes with export the system on editor or on (data/)catalogs/Catalogs0974.pak/planets/Asteroids.sc. I did not yet asteroid belt in my system. Request JackDole, I think he a made a exemple (not sure). PS : Of course, not edit or create any files in the pak. Guys, I could really use some help and response, cause I worked really hard and spent several hours to solve it before writing here with screens and logs. I showed you planets looking like moth-eaten coat And everybody's like it's ok. I just don't understand. I'm afraid a driver update will not help here. The graphics card is too old. As far as I see it, the latest driver for your graphics card is version 13.9 from 10/15/2013. And that might be the problem. The graphics card is too old. 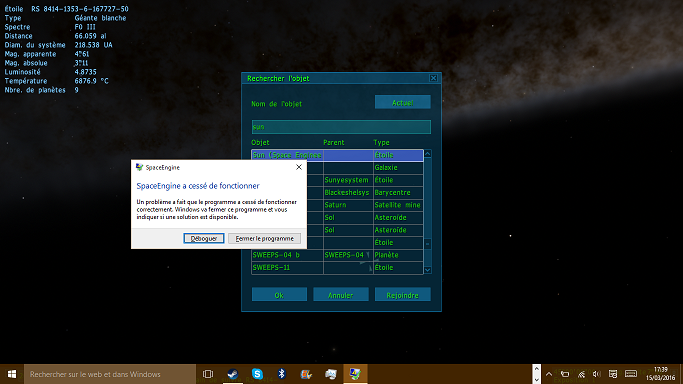 Space Engine crash when I select my system but if I disable the mets planets leaving the star, it will. I do not know whence it, I join the se.log, a screnshoots and the code in my file planet. If find you where this bug, please let me know. In fact, with or without the commentary of the color of the cloud of Alien would bug also. I note that before I insert colors and clouds in the code, I could still go to the system. My texture file is well correct, I check. DiffMap "(Name the diff map)"
Weird before that worked with just the bump map before I put colors as if it does not, it generates the texture according to the bump map. Here I describe how to create an asteroid ring. Meanwhile, I use a different method. I'll try to make it. It will be in flash and ugly, but it will have a UI. Is there something other than the stuff in your batch file I should add for parameters? Is there a need to create multiple rings at the same time? Somehow randomize the limits? Could you go into it in a bit more detail? Let's talk in this thread about these things.